So for the hot month of August (where is the summer going?!?!) I will be focusing on Mistresses! 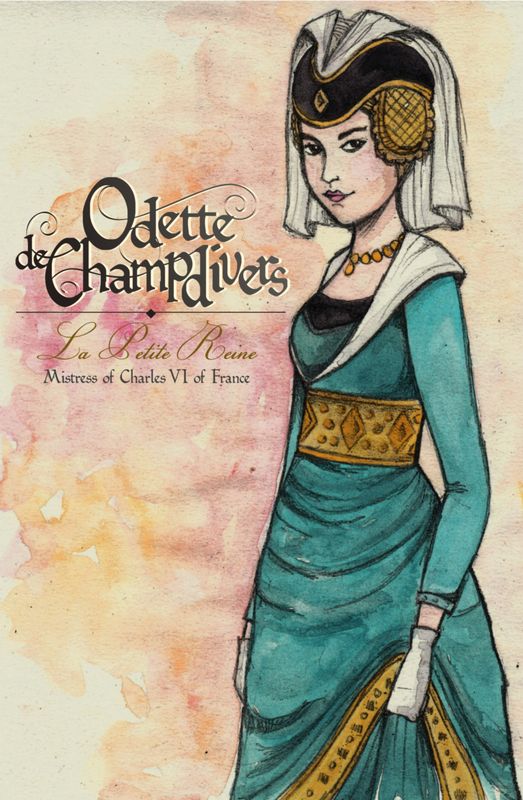 Odette de Champdivers (1390-1425) was the mistress of Charles VI of France. Charles was married to Queen Isabeau of Bavaria. This was a tumultuous relationship to say the least- due to Charles’ (possible) Schizophrenia, Isabeau became the victim of terrible tirades and beatings. So much so, she allowed the King to take on a mistress. Odette was only 17 when she began an approved affair with the King. The two had a very close relationship- he nicknamed her “La Petite Reine” or “the little queen”. They had one daughter and named her Marguerite (who was eventually provided for by her half-brother Charles VII of France). After his death, Odette and Marguerite lost their royal pension and were reduced to poverty. She earned some money as a spy, but ultimately died with nothing.